Since the opening of Venice Skatepark, the crew has organized a Turkey Killing. The name has changed, but this is now the third time the contest is in action. 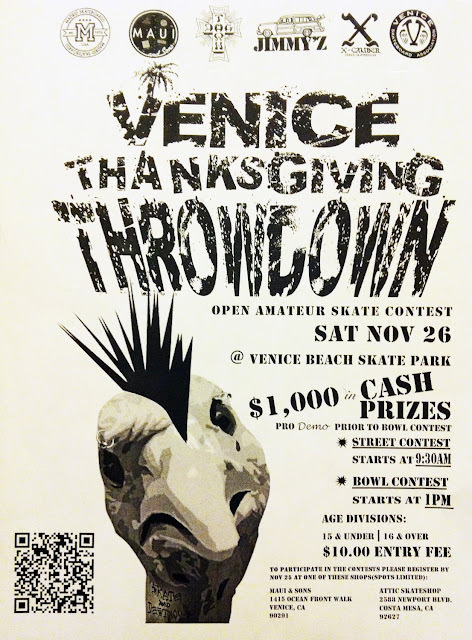 The first annual Venice Thanksgiving Throwdown skate competition will be held on November 26th, 2011 at the Venice Skatepark. The event is open to the public and there will be $1,000 in cash prizes! The street competition starts at 9:30am with a bowl competition at 1pm. There will be a professional skate demo before the bowl competition with Christian Hosoi, Daniel Cuervo, Jeff Wright, and more! The age divisions are 15 and under and 16 and over. Skaters can register at Maui and Sons at 1415 Ocean Front Walk! Hosted by Madrid Skateboards, Maui and Sons, X-Caliber Trucks, Dogtown Skateboards, Jimmy'Z, Venice Skateboard Association, and Hosoi Skates.